How do you feel about Valentine’s Day? Do you like to celebrate it? And if so, what do you like to do? In our house, admittedly, we tend not to celebrate it that much. A delicious home-cooked meal is a must, but that’s about it! It’s not that we’re miserable – no way! But we believe that every day should be about loving those around us, not just one (highly over commercialised) day! However, in this house, it’s any excuse for a good meal! So of course, I simply HAD to make a Valentine’s dessert for the blog. It would have been impossible not to. Criminal, in fact. 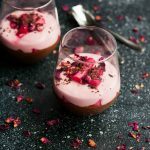 I pondered about what to make for so long before settling on these Rhubarb Rose Dark Chocolate Parfaits! Do you ever get that, where you get about a million ideas pop into your head all at once, but none of them stick? That happened to me as I was thinking about desserts to make for Valentine’s Day – because of course it had to be dessert, that much was for sure! I had too many ideas and couldn’t settle on any one of them or get the specifics cemented in my brain. Until these little parfaits popped into my head that is! As soon as I had the idea, I knew it had to happen. And it did and trust me it’s every bit as good as I thought it was going to be! I mean, it had to be rhubarb, really. At this time of year, the sight of those lurid pink stems is irresistible! I love any kind of rhubarb, but the forced rhubarb grown in the famed Rhubarb Triangle in Yorkshire is the best. Pretty pink colour aside, its flavour is just incredible and it’s far sweeter than standard rhubarb, too. The gentle tartness pairs beautifully with dark chocolate and cuts through the intense creaminess of the chocolate layer. Finally, a touch of rosewater adds a gentle perfumed sweetness and that Valentine’s appeal. You can leave the rosewater out but it works so well with the rhubarb that I urge you to try it! I chose to make these using coconut cream, which, aside from making these entirely vegan as long as you use dairy free chocolate, has the added benefit of making these super simple to make! Not that it’s particularly hard to make a chocolate pudding out of eggs and cream, but there’s something very satisfying about pulling a can of coconut cream out of the cupboard, opening it up and whipping up something tasty. Which makes these especially good to make for Valentine’s Day and well, any day really! 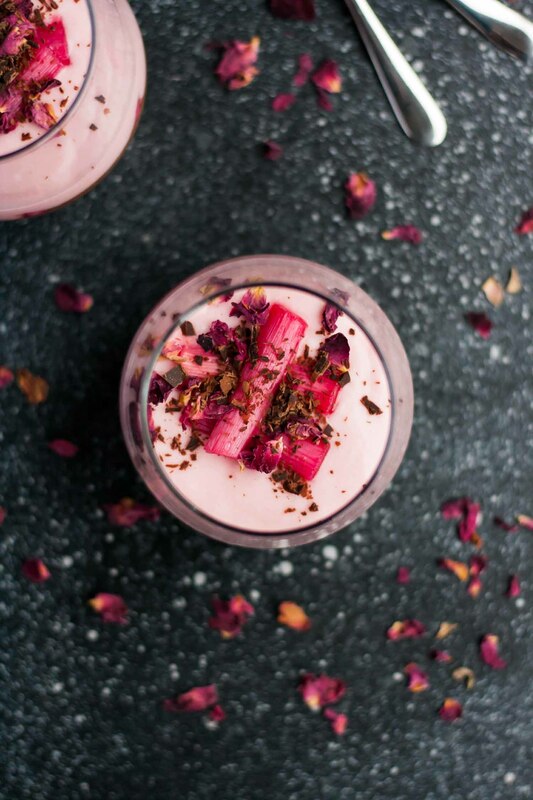 The coconut cream is split between a super creamy chocolate layer and a softer, zingy rhubarb layer on top, with chunks of tender roasted rhubarb in between. These are heaven in a glass! And too pretty! Oh and just so that you know, what you see in these pictures is not a serving size! Those glasses are huge but I didn’t have anything smaller when I made them. My husband and I shared each glass. I’d recommend that this mixture makes at least 4 servings, but I’d possibly even go to 6 servings. 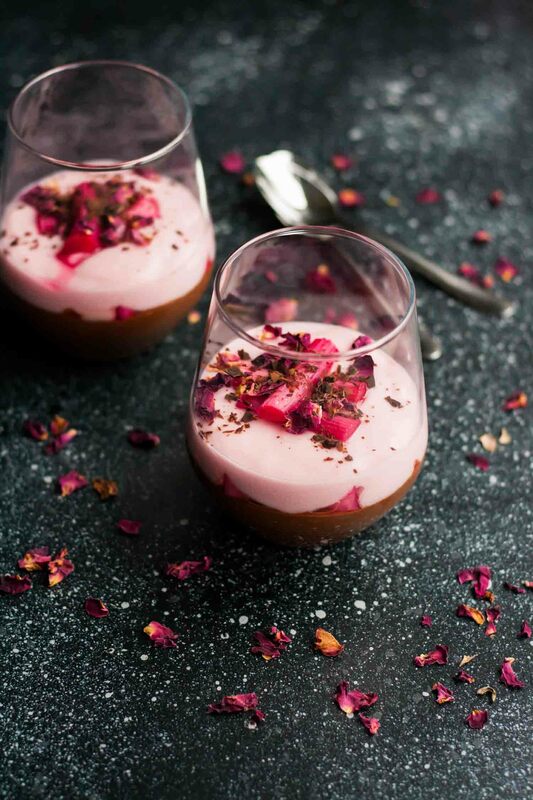 These are very rich – and if you take a quick peek at the nutrition label for this recipe, you’ll see that coconut cream is very high in saturated fat so this really is an indulgent dessert! Perfect for Valentine’s Day, huh? Enjoy yourself! Chop the rhubarb into short lengths. Toss with the sugar and rosewater and spread out on a tray. Cover with foil and place in the oven for 10 minutes. Remove the foil from the rhubarb and return to the oven for a further 5 minutes until tender and the juices are syrupy. Leave to cool. Puree half of the roasted rhubarb - you should have about 1/2 cup. 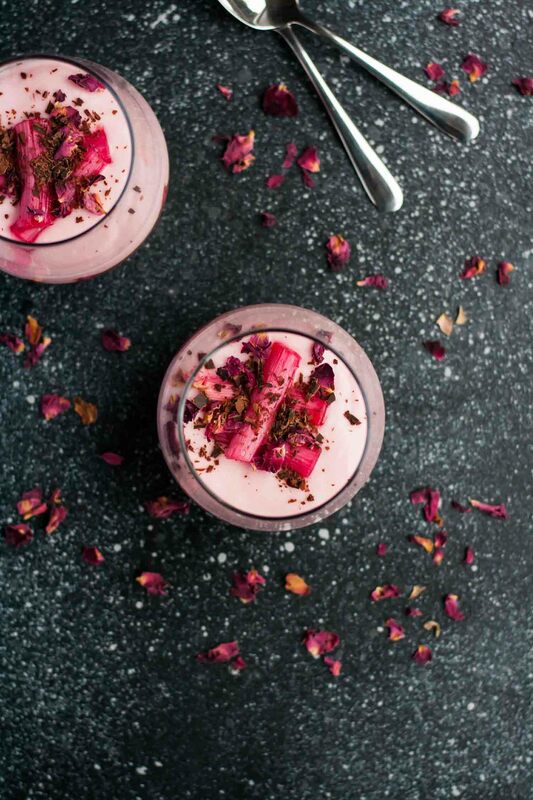 Whisk together the rhubarb, coconut cream, sugar and rosewater until well combined. Place in the freezer to chill for up to an hour whilst you prepare the chocolate layer. Whisk together the chocolate, coconut cream, cocoa powder and a pinch of salt, if liked. Place into the freezer for 20 minutes until the mixture has set. Whip using a stand mixer or hand mixer until light and fluffy. Pour the chocolate mixture into a freezer bag, snip off the corner and use as a makeshift piping bag to decant the mixture into serving glasses. Place a couple of pieces of rhubarb on top of the chocolate layer and then pour the rhubarb mixture over the top. 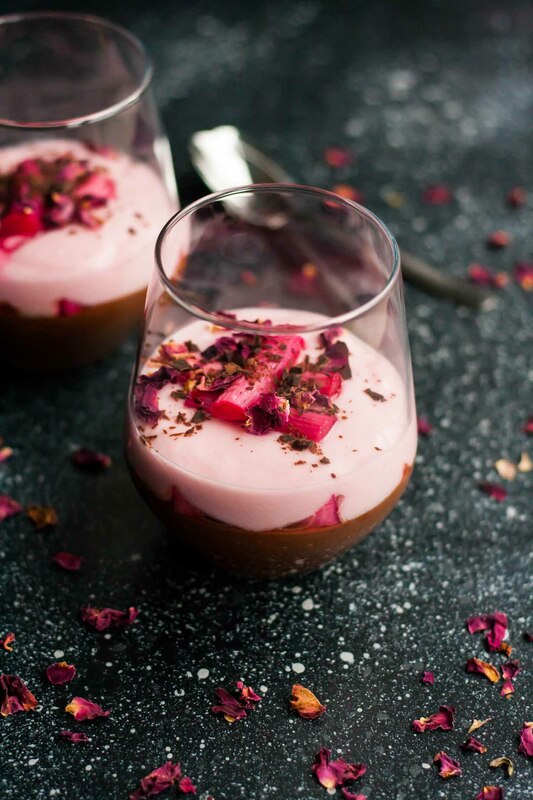 Finish with some more roasted rhubarb, chocolate shavings and a few rose petals if you want to make them extra pretty. The rhubarb mixture won't set up as much as the chocolate mixture, but it has a lovely soft consistency which sits perfectly on top. Love this dessert Sasha! The flavours go together so well. And the photos look awesome! What a unique treat! Never had rhubarb with chocolate before, sounds like a great combination. You’ve given me another reason to look forward to spring! Can’t wait til my rhubarb comes in so I can try this!